Two important news stories have been reported in the international media that point to a digging in of entrenched positions that are further isolating Pakistan in the world community. First was the story reported in The New York Times that US is considering withholding $255 Million in military aid due to ‘dissatisfaction with Pakistan’s broader intransigence toward confronting the terrorist networks that operate there’. Specifically, the Americans are frustrated because Pakistani agencies refuse to let them talk to a Haqqani Network militant captured in the raid that freed American hostages earlier this year. It is a very interesting question why our agencies don’t want the Americans to talk to a Haqqani Network militant, even after he was captured in a raid with foreign hostages. Are they afraid of what he might tell them about receiving support from certain elements within the establishment? Even if this is all a conspiracy theory, isn’t it true that preventing him from speaking to American law enforcement only makes the establishment look more guilty? 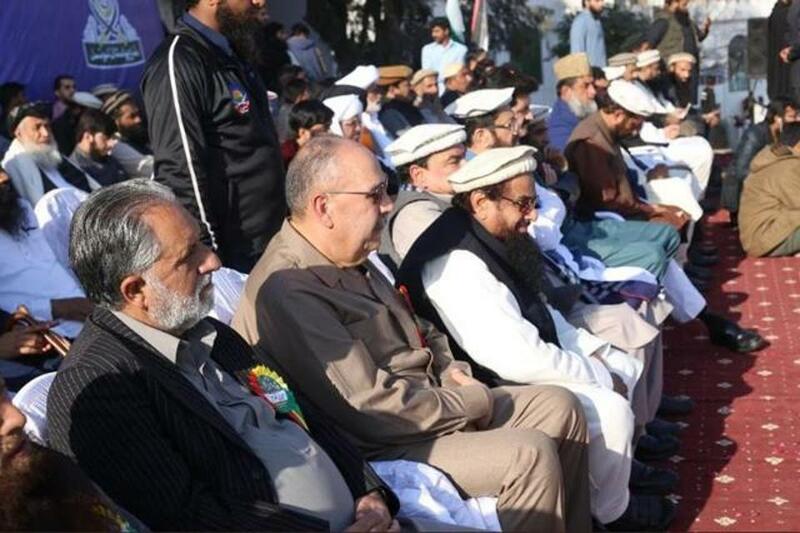 The second story comes from a recent appearance of Palestinian Ambassador to Pakistan Walid Abu Ali on stage at a Difa-e-Pakistan rally standing next to none other than Hafiz Saeed who was freed once again a few weeks ago. Ironically the Jamaatud Dawah chief was set free after “a senior finance ministry official failed to convince the board that the release of Saeed would bring diplomatic and financial problems”. Diplomatic problems have certainly come into play, however, as Palestine has recalled its Ambassador due to his appearance with Hafiz Saeed on the DPC stage. 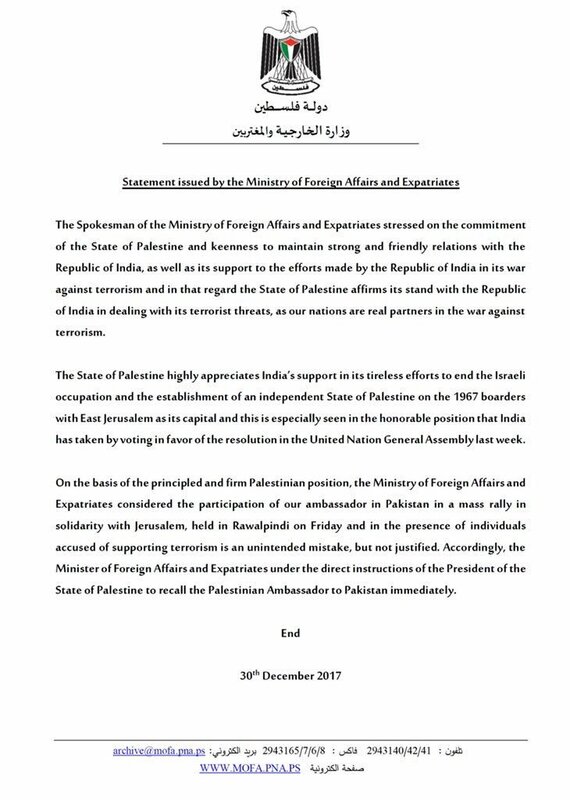 According to a statement by the Palestinian Foreign Ministry, “The State of Palestine highly appreciates India’s support in its tireless efforts to end the Israeli occupation” and terms attendees of the rally in Rawalpindi as “individuals accused of supporting terrorism”. Blind and deaf to the diplomatic disaster that had broken, our own Foreign Office issued its own statement defending the recalled Ambassador and defending Hafiz Saeed. In these two highly sensitive matters, it appears the state has chosen to side with the controversial militants rather than foreign governments. In this case both the US and Palestine. In the case of the Americans, even our own frustration with their unreliability does not explain what we gain from hiding a captured militant and looking guilty of their accusations. The case of Palestine is even more puzzling. By all appearances we have simply decided that these militant groups are more important diplomatic allies than world powers or oppressed Muslims. Finally, it must be noted with some additional irony that in one report on these stories, Dawn termed Husain Haqqani as ‘disgraced ambassador’. While Pakistan receives multiple black eyes from internationally blacklisted militants, petty journalists continue peddling personal jealousies and prejudices instead of educating the nation about the very dangerous path that these stories show we are heading down. As one international analyst noted on Twitter, far from ‘disgraced,’ these stories appear to have ‘vindicated‘ Husain Haqqani and what he has been trying to warn us about since long. This entry was posted in Blogs and tagged Hafiz Saeed, Haqqani Network, husain haqqani, Palestine by Mahmood Adeel. Bookmark the permalink.